A division of Penguin Group (USA). On the night of her twenty-sixth wedding anniversary, AnnieLaurie McFall does the unthinkable. Without a word to her husband, Jess, she walks out on their celebration dinner and catches a flight to Florida. It's time for a sabbatical - and some serious soul-searching. What she discovers along the way is far more surprising, outrageous, and just plain fun than she ever expected. "Those who remember CRYBABY RANCH will find ... FAIRY TALE BLUES equally well written and satisfying ... either ... book would make excellent book club choices." "... deftly explores autonomy in marriage ... Welling sets the scene with vivid descriptions of internal trauma and external beauty, writing so masterfully that readers are sucked into the story from the start... It's a rare author who can write as convincingly from the perspective of dual characters, especially those who are dueling, fighting to stay married while staying true to themselves.... Anyone who is married, has been married or has contemplated taking vows should go to therapy. 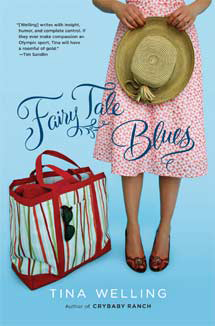 Or read Fairy Tale Blues; at $15 it's cheaper, and just might be as effective."